If you’ve been following me for a while, you probably already know by now that sunsets are one of my favorite subjects. Because of their beauty, they always make me feel inspired. I shot this one evening last week. This was one of the last photo shoots I did with my daughter a few years ago (she’s in college, so I don’t see her often enough for shooting). She was trying to move the scarf around when the wind caught it over her face, so this was a funny moment for us. This photo was taken on Valentine’s Day this year at Bulow Plantation on the Tomoka River. The blue sky reflecting on the water evokes a calmness and a “blue” feeling with the lone branch dying to keep above water. This couldn’t have been more appropriate and ironic for my situation at that moment. You can feel the emotion in these photos, Shannon. The picture of your daughter made me smile. 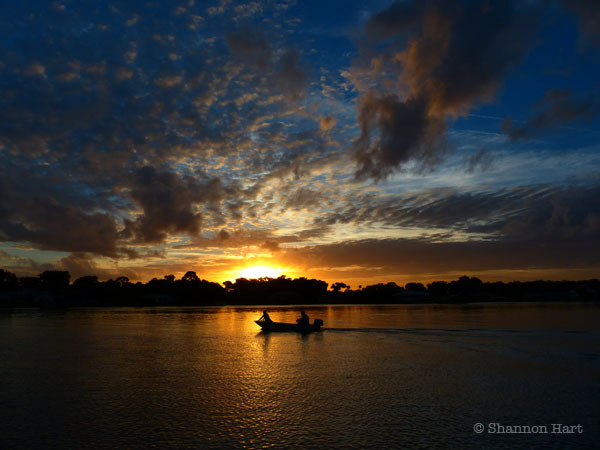 Shannon, your have chosen your photos well for this week’s challenge. Your daughter’s photo looks like some fancy photo shoot with a model. Well done on all three photos. You sunset picture claimed my attention. I like sunset also. Lovely all three of them – I adore the photo of your daughter – smart and funny! Such wonderful photos for this challenge. The scarf moment makes me laugh too. I really like the log reflection in the water too. I never tire of seeing beautiful sunsets. Congratulations! I have given this post the Gold Star Award for Cee’s Compose Yourself Photo Challenge Week #2 What All Well-Composed Photos have in Common. I’m glad you are having a better week.